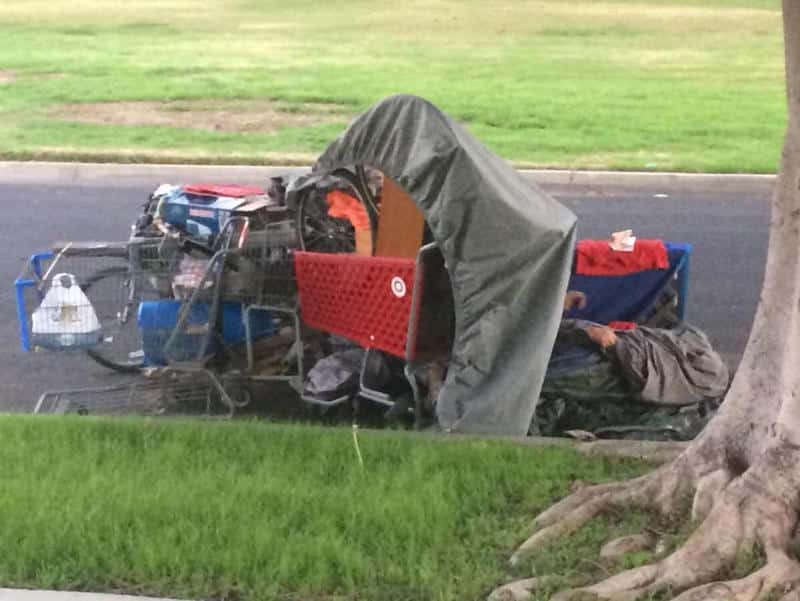 Photo of a homeless man, from Nextdoor. Do I want homeless people parking their shopping carts on my curb and sleeping in front of my house? At the risk of sounding disturbingly candid, no, not really. I’m compassionate about a lot of things, like animals, but I’m not going to throw the rumpus room open to give safe haven to one of the last remaining black rhinos in the world. I will, however, cheerfully agree not to shoot one for the sweet and potent aphrodisiacal properties of its horn. Compassion is today’s topic, and let me start with a question: Where do you turn for compassion when you’re on the Internet? If you guessed the neighborhood social website Nextdoor, I truly don’t appreciate the sarcasm, though it was, in fact, the answer I was looking for. I’ve leaned a little heavily on Nextdoor over the years, I’ll admit, but where else are you going to find such open-hearted admissions of how horrible people have become, as told in their own words? I don’t always go running to the site for columns. You didn’t hear a peep from me when its members exploded into rage and unnecessary NIMBYism after I wrote a prediction that El Dorado Regional Park was going to be turned into The Jackie and Ernie Kell Homeless Center in 2019. I wasn’t happy with my willowy editor for writing a headline proclaiming the column to be “not so serious” because what kind of moron did she think would take it seriously? There is an answer to that question, and you could look it up on Nextdoor. Now, if we can skip past the ensuing argument over the various latter-day ramifications of the word “Pride,” we can jump into the matter at hand, which is people living in the gutter. To be fair, for once, to Nextdoor posters, there were quite a few who urged a certain measure of compassion and love, though plenty had no truck with libtard alligator tears. Back to our original poster, who employs the homeless-by-choice argument, because who wouldn’t rather be homeless than have a home? Ah, the carefree life of a hobo!